Each classmate has an individual profile page that they control - add as much information as you like, including pictures. You control updating of email, address, and telephone contact information. Our Class of `64 Site is Ad Supported to Keep it Free - We Do Not Share Any Information from the Site, Nor We Do We Endorse or Control the Ads That Appear From Time to Time. The Baton Rouge High School Alumni Association was reorganized as the Baton Rouge High School Foundation in 2010. 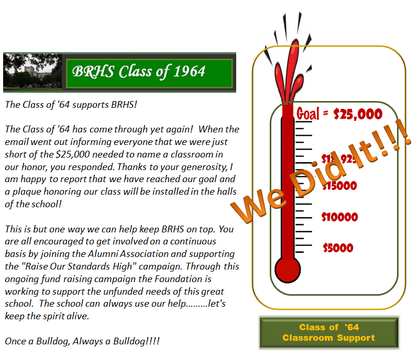 The Baton Rouge High Foundation Membership is open to all who contribute to the annual fund campaign. This website was constructed by and for the 1964 graduates and classmates of "Dear Ole Baton Rouge High" We hope that you enjoy it and those that have found it for the first time will come back often and become regular contributors to your Profile Page and notifiy us when you have information that should be made available to everyone.